“HANARART” is an art festival held in Nara, one of the oldest ancient cities in Japan. In HANRART, many local people engage in the aim of promoting the values of local treasures such as Machiya, Japanese traditional houses. We’ve planned Hanarart to remind you the attractive diversity of our culture including modern artwork and Machiya. Our goal is to revive our beautiful culture by using the existing Machiya to display a lot of different artworks relating to there culture and atmosphere. Our approach that each local organization coordinates the venue by themselves is considered uncommon and extraordinary. “HANRART CORE” is a main exhibition area of HANARART in which “Curator sites”* are located and various modern artworks are exhibited. 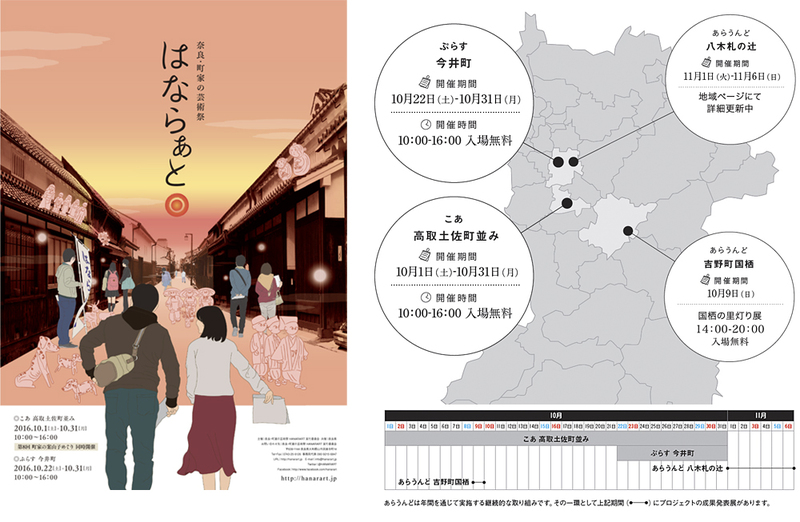 Our aim is to change the traditional images and values of these areas.For this purpose, applicants’ works are exhibited and regional events are held at the same time. “Curator sites”* is the sites which curators organize the exhibition and event that would prompt to find and create new values through deep consideration of “locality” and “art”. “HANARART PLUS” is a satellite area of HANARARTwhere each local organization takes a leadership to run variety of exhibitions and events in each area. We’ve been tried to provoke the image or value of Nara and the area where we get together for Hanarart. For this purpose, we also display some of artworks submitted by public and have the community events.